Synopsis from Godreads: Gabriella’s past is a mystery, but that never stopped her from achieving her goals. As a supernatural specialist, and far more intelligent than anyone her age, she has always been ignored by her peers. Because of the isolation she has always felt, she put her life and soul into her job. Being a supernatural specialist hasn’t given her the divine intervention she always longed for, until one day a shipment arrives from Italy containing three dead bodies with an uncanny ability to regenerate. Gabriella is frightened and intrigued, but not as scared as she becomes when a dark creature attacks her. As the bodies come back to life, the plot takes an unexpected twist that you won’t see coming. The supernatural world only begins to unfold before her as angels appear, her dreams start to haunt her, and the very past she has forgotten comes back with startling clarity. Romance blooms, escape plans are made, an assassin is out to kill her, and death is only around the corner. But what is more terrifying than all of it is the fact she is the chosen one, the Illuminator, the one who will save them all. One of our very first fans, Brianne Villano sent us an author signed this book as she is the editor. Bri is an awesome social networker who posted our videos on YouTube and kept our Twi Touring group company at TwiTour New Jersey, but best of all she introduced me to this phenomenal series! I savored the story and the characters whom I feel like I connected with on many levels. The main hero, Andrew is an angel as well as perfect! He comforts and supports Gabriella while being a perfect gentleman. I can honestly say I am going through withdrawals since I finished the book. Can’t wait for book two to be released so I can have more of Andrew, Gabriella and Joseph, the other swoonworthy male protagonist who is also an FBI agent. Laura creates an emotionally riveting mystery full of myth , magic and romance. I gave it five stars and would recommend it to all of my adult friends! Book two can’t come fast enough and Laura has promised us a teaser to post later on our blog. 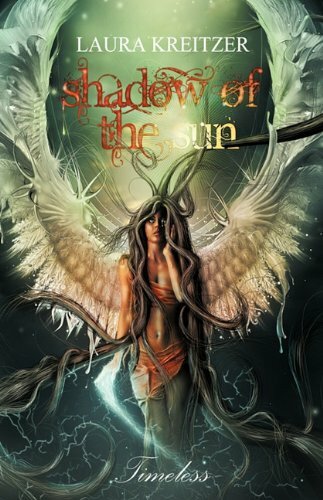 In the meantime she is giving away a signed copy of Book One of the Timeless series, Shadow of the Sun to one of our readers! +3 love Winged Key Necklace on your angel shop! This book sounds great and the cover is beautiful! +3 By far my favorite in your shop is the Wings Outstretched Necklace. So pretty. Awesome review! I had this one on my tbr list. +3 my favorite is the wings inside the heart necklace.. so beautiful! oh no! I counted wrong on my post above,, sorry..
an international giveaway, Yay! I would LOVE to read this book! +3 love your angel wings necklace in your angel shop! Author of Shadow of the Sun +1,000,000 pts. 😉 I kid, I kid! So happy to read your wonderful review of my book. Thanks for the support and love. 😀 BTW, you can read the first chapter of Soul Stalker on my website. I’m Dovile and I’d like to enter too please. Unfortunately bandwidth problems mean all I can do is comment ! This looks like a great book! Please enter me in the giveaway. +3 visit our angel shop and pick your favorite item: Crescendo Inspired Feather Choker – this is gorgeous!! Wow this is sooo amazing! Please count me in!